When you have friends coming over on a Sunday afternoon, friends you love and rarely see, you have to have coffee cake. 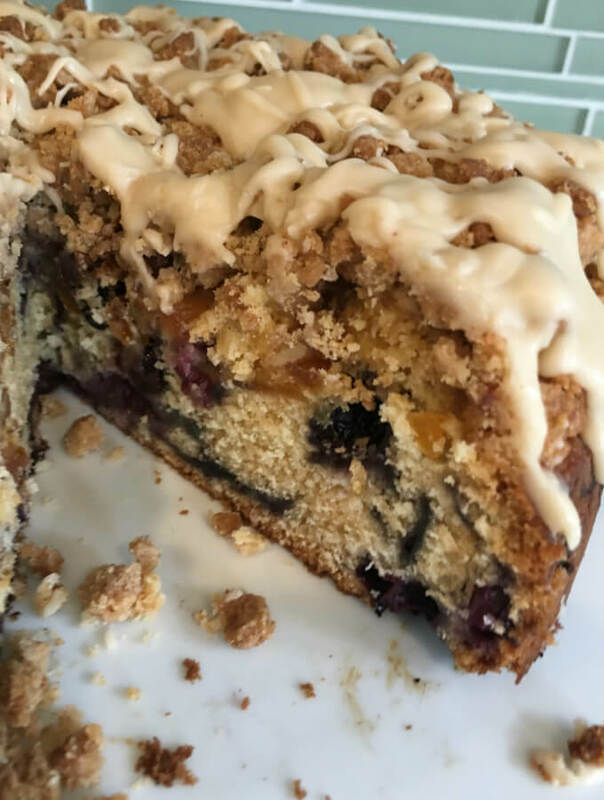 And, believe me, this Marmalade and Blueberry Coffee Cake with Bourbon Drizzle is the coffee cake to end all coffee cakes. And, it’s surprisingly easily to pull together. This recipe is open to substitution. If you don’t have marmalade [make mine, or] just use jam. If you don’t have blueberries, use another fruit or skip it altogether. If you don’t have sour cream, use buttermilk or whole. If you don’t want to sprinkle on pecans, use another nut or skip them altogther. And, if you don’t want bourbon in your drizzle, use citrus juice or cream, or skip the drizzle altogether and dust the cake with icing sugar. One thing to note about coffee cakes like this one, the batter is going to be really thick. You are going to wonder, is this cookie dough? Is the cake going to become a rock when I bake it? No. It won’t. It will be wonderful. Butter and flour a 9-in spring form pan or a high-walled pan of similar measure, and line with parchment paper. Wash and dry the blueberries, toss with 1 tbs of the 2c flour from the cake recipe. If your marmalade is refrigerated, place it in a bowl and allow it to come to room temperature. To make the Crumble, add the sugar, spices, and salt to the melted butter and whisk until the sugar has dissolved. With a spatula, add the flour and mix into a dough. The crumble will look like grainy maple fudge. To make the Cake Batter, in a bowl, whisk the flour, baking powder, baking soda, and salt, and keep handy. In a mixer or by hand, mix the butter and sugar until fluffy. Add 1/2 of the flour mixture and beat until combined. Add 1/2 of the sour cream [i.e. 1/4 cup] and beat until combined. With a spatula, fold in the berries. This won't necessarily be easy. Try not to crush them. Scoop the batter into the pan and smooth it flat with a big spatula. In a small bowl or jar, stir the marmalade until it is smooth. In clumps spaced evenly around the pan, add the marmalade to the cake batter by the dollop. Top the batter evenly with the chopped nuts if desired. Sprinkle the Crumble topping over the cake, breaking it into large crumbs with your fingers. You might have to use a spoon or spatula to scrape the crumble out of the bowl. To make the Drizzle, add 1/2 c of the icing sugar, the vanilla and the bourbon to the melted butter, whisking to combine. Add the citrus juice to the combined mixture and whisk to combine. Add the additional icing sugar and whisk well until thoroughly combined and thick.